Angi Spector is the Director/Owner of Mind•Body Connection Fitness Studio. One of the Bay Area’s most experienced trainers, Angi was certified by the Physical Mind Institute in 1994. In addition to offering the MBC Pilates certification program, she conducts the Gyrotonic® pre-training teacher certification. She is also a 14 year Yamuna Body Rolling Practioner and 12 year Yamuna Body Logic Practioner. She presents trainings in Alameda and Emeryville and throughout the Bay Area. Angi has also trained extensively in Laban Bartenieff. She uses this proven system of movement analysis as the foundation of her assessments and many mind body fitness tools. She helps people learn to play and live more efficiently and effectively with more enjoyment. Leslie Schickel brings a life long love of self examination through body, mind and spirit practices to her teaching. Leslie grew up studying classical ballet before becoming a professional contemporary dancer with SF Contemporary dance company, Kunst-stoff. Along side her professional dance career, she taught Gyrotonic at San Francisco Gyrotonic from 1997-2010. Since moving to the East Bay, Leslie moved her practice to Angie Spector’s Mind Body Connection. Leslie is a Master Trainer in the Gyrotonic Expansion System, which means she can train people to be teachers and work with clients on all of the specialized equipment. She teaches yearly Trainer Updates, Pre-trainings and Foundation courses. Leslie also teaches Spinal Release Yoga at Emeryville Yoga, contemporary dance, classical ballet to teens and works as a freelance choreographer. 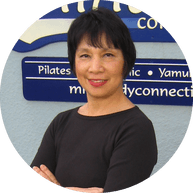 ​Janna Matsuoka is a Physical Mind Institute Certified Pilates instructor. She has a Gyrotonic Level One certification with Master Trainer Tamara Yoneda. Janna’s strong dance background allows her to access the technical and creative aspects of her practice. Patricia Powers is a Yamuna Body Rolling Practitoner, and Certifying Instructor Trainer at the Yamuna New York Flagship Studio. She is trainied in YBR, Body Logic, Hands-on Table, Face Ball and Foot Fitness. She is also certified in Stott Pilates, Prana Yoga, Tai Chi Chuan and Usui Reiki. She is most interested in helping clients clear the path to greater fulfillment and creative expression in their daily lives, physically, mentally and spiritually. Prior to developing an extensive background as a bodyworker and mind/body wellness instructor, Patricia has over 20 years of experience as a performing artist, dancer, choreographer and creative movement instructor to people of all ages. She has developed an ability to honor each person's uniqueness through extensive study of astrology, philosophy and psychology.